Helps you learn important concepts of electronics while you work on real projects. This book is suitable for beginners as well as people with intermediate skills who want to learn more, as well as for students or hobbyists. If you want to learn how to build things with electronics, get a hold of this hands-on book. With this practical introductory guide, you'll learn important concepts while you work on real projects. And you'll pick up basic electronics tips and techniques from an expert who makes it easy, entertaining, and fun. You get complete step-by-step instructions for each project, easy-to-follow circuit diagrams, helpful full-color photographs, and engaging explanations of the principles behind what you're building. 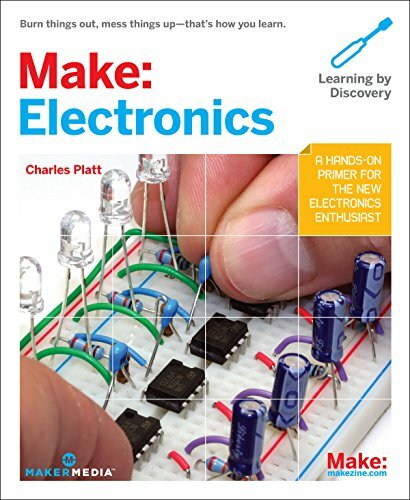 "Make: Electronics" is for beginners as well as people with intermediate skills who want to learn more - an ideal gift for any student or hobbyist.